JD & I decided to go to Norfolk for the weekend. Well, not really the weekend, more like staying over for one night. Still, it is nice to be away from home for a change. 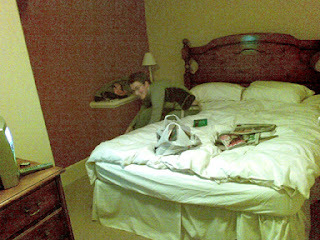 We checked in to the Black Boys Hotel in Aylsham which was nicely located in the town centre. It looked more than a bit shambolic when we were taken to our room and we exchanged some worried glances as the stairs creaked and the door to our room opened. The floor was not level, the room was very small, the bed was wonky and the wardrobe looked like it was about to fall over. But the room was lovely and warm. After a hearty lunch of ham & eggs for me and an overdose of fried scampi and chips for JD, we strolled around the tiny town. Then, suddenly, without warning, a lovely little second hand bookshop appeared. Books piled up everywhere, in no particular order it seemed. We walked around like kids in a candy store, discovering new books and old stuff wherever we turned. 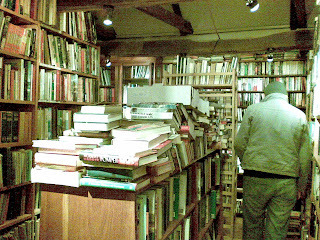 It only became a little more annoying once we started to look for one particular book. Randomly finding stuff is great but if you are searching for something in particular, the chaos-thing is not so attractive. We spent the best part of 90 minutes in that shop. Lovely! We naughtily spent the evening reading all the books we bought at the shop (Jeeves & Wooster, Chris Baldacci, Karin Slaughter, some vague old lesbian book that made me laugh and some other random stuff) in our bedroom. Not really wanting to spend more money, we decided not to go out for dinner. I went down to the bar to get something to nibble but changed my mind and returned to the room with a cheeseburger and fried fishcakes from the local fish & chips shop. fat dripping off it, we ate them in bed with the TV on, reading our books and listening to the radio at the same time. 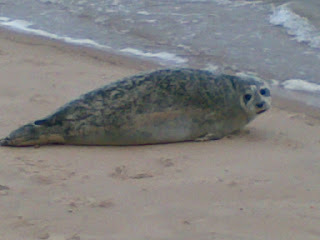 The next day we went to the beach at Wells-next-the-Sea. And there is spotted my first ever seals in the wild. It was fabulous. They are so sweet. I want one for Christmas. First there was only one and then 2 more popped their heads up from the waves and crawled on to the shore. Lovely. Made us forget the bitching cold!! The trip was finished off with a short visit (read: drive-through) to Swaffham, the town there Stephen Fry's TV series 'Kingdom' is filmed. All in all, it was rather nice, especially as it snowed on the way back so we felt really wintery! !